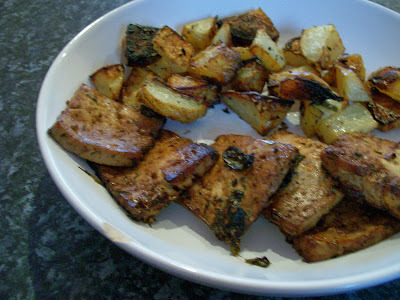 Lemon-Herb Tofu and Lemon-Rosemary Potatoes. Both from Vive le Vegan. Both unbelievably delicious. Whenever me and Gary go out to eat at somewhere not very vegan friendly and ask them to make us something 'off menu' (or phone ahead and arrange it), we always have a bet on that we'll end up with stuffed peppers. We always win. 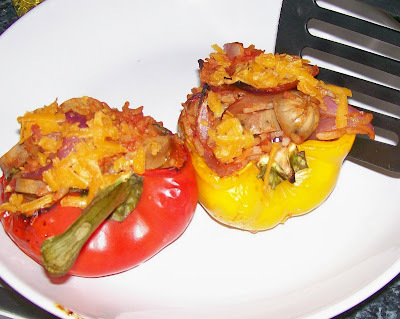 So when I suggested stuffed peppers for tea tonight Gary was sceptical. 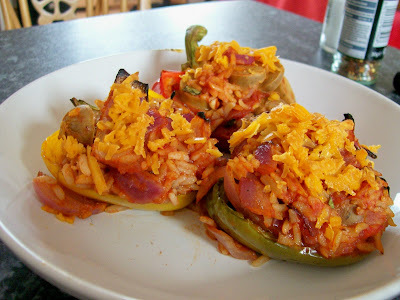 There is one fundamental difference between the fancy pants restaurant stuffed peppers and mine though - mine taste good. So here they are, first rubbed with balsamic vinegar and olive oil and roasted and then stuffed with rice, tomatoes, basil, sliced sausages (vegi deli), red onion, and topped off with some cheezly (the non melting kind, which is why it's not... melty) and baked. I also made orange scones a few days ago, but I eated them. It's been nearly a month since I posted anything!! That's terrible! I'm bad, I apologise. Okay, so I've got some food and some product reviews (well really me going "mmm... these are good..."), so lets get on with it. We had some leftover Venn Pongal (from Dino Sarma's Alternative Vegan), so I decided the best way to go was to take this lovely, healthy, wholesome meal, and make it unhealthy! Yeah! 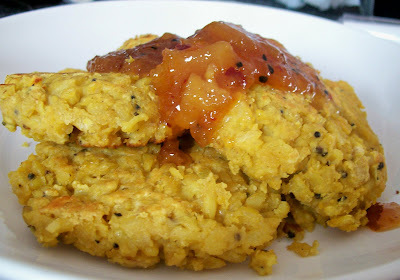 I added some gram flour to it and made venn pongal cakes. Topped off with some mango chutney. Delicious. 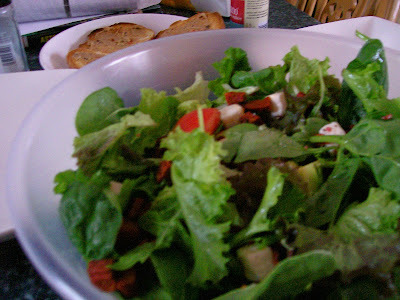 Here's a picture I found on my camera of something I made for lunch ages ago. 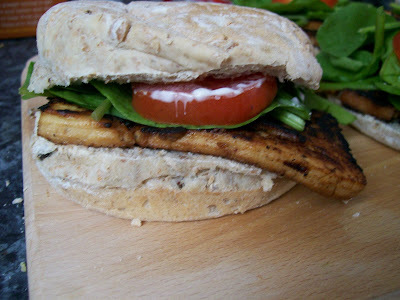 It's tofu (marinated in teriyaki sauce), tomatoes, spinach, and mayo, all in a wholemeal bun. It was so very good. You know how sometimes you wake up in the morning and feel like being a 1950s housewife? Just me? Meh. A few weekends ago, I woke up at 7 (I know, I'm insane) and made a pie. I don't know why I did it. It just sorta happened. 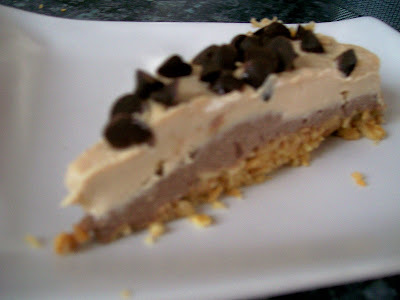 So I made a pie with a layer of chocolate mousse and a layer of peanut butter mousse. I didn't use a recipe, I just kinda flung stuff in a blender, still half asleep. I ate one slice, Gary ate the rest, for he is a huge fatty. Sorry about the rubbish photo, I must have been itching to eat it. Okay, now we have some product reviews (kinda) and the best damn salad the world has ever seen. The product review pictures were taken by Gary whilst I was making the salad, which is why they're rubbish. First up is Redwoods new(ish) feta cheese. 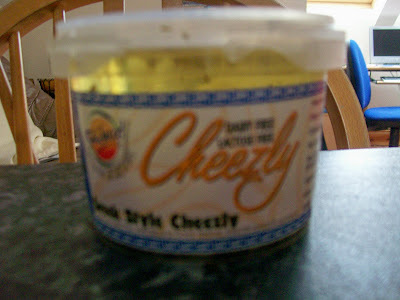 Me and Gary both loved this stuff. It is so creamy. I don't quite understand why it's in the crazy oil, but I tried to drain as much off as possible before eating it. After we had it in the salad, we had some on pizza, and it was great. It didn't quite melt, but it went gooey (like, you know... feta). Uh, devine! Next up is Redwoods new Chorizo. Also delicious (and I swear I'm not being paid by redwoods, although all bribes are graciously received). 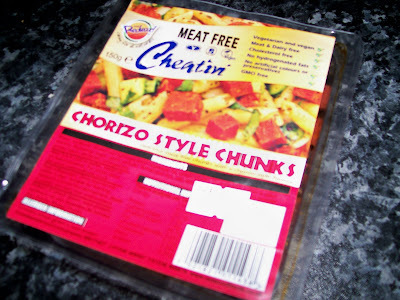 I've never tasted deathy chorizo, so I can't make a comparison, but this was lovely, and smoky, and spicy, oh my! It comes in little cubes, which is... handy? We also had this on pizza after the salad (not the same night obviously), and Gary said it was 'the best pizza he'd ever had' but he says that every time we have pizza.